I love to see creativity in workshops. 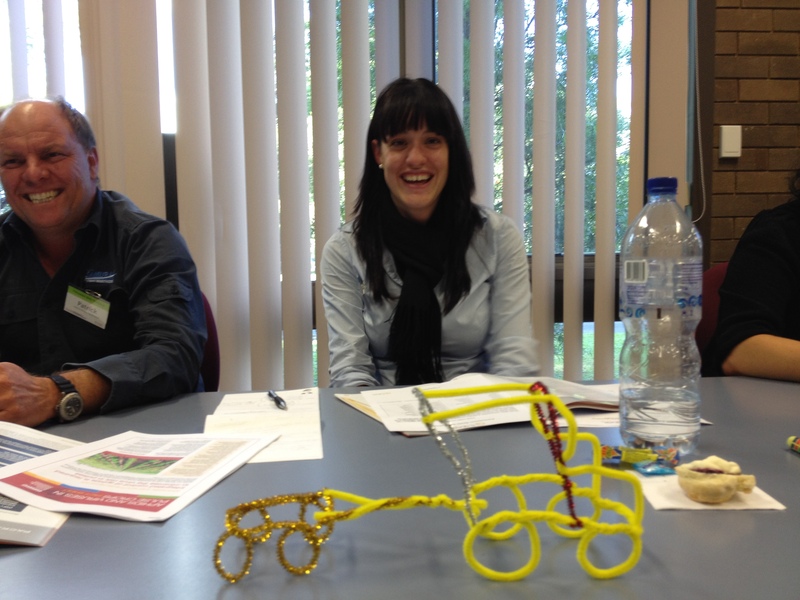 Providing things for participants to play with like pipe cleaners and stress balls is so simple and so effective. Pipe cleaners can be made into all types of objects, fiddled with, rolled around fingers and the great thing about them is that they are quiet! I’m always amazed at the adults in my workshops who are delighted when they discover the pipe cleaners are not on the table for a mysterious facilitative activity but are simply there to play with. For many of us its a long time since we sat in a school class room all day, we are used to being busy, active and having things to do with our hands. Kinaesthetic learners tell me their learning increases if they are busy doing something, and this includes playing with toys. It may appear like they are not interested or participating in the program; experience has shown me this is not the case. Cheap shops provide a great array of soft toys, balls and blocks which can be put on the tables. They add a sense of fun and lightness and assist with creative thinking. Recently one of the participants collected all of the pipe-cleaners at the end of the workshop and asked if she could take them for a meeting the next day! Make the learning experience fun, enjoy the outcome and the creations! I have just been training people on how to be “trainers” and had a range of things to play with as well as coloured pencils textas coloured paper etc etc. Was a very small group with prob only 2 kinesthetic learners but during a session that they were practicing, the presenter had a picture of some arm muscles in b&w and the kinesthetic learner asked if she could colour hers in!! I know she was paying attention but needed to be doing something. Is most important to cater for each learning style and not panic if you think someone is not paying attention!!!! I bought some pipe cleaners – bedtime books have become much more pleasant as a result – just an example of how we can transfer these gems across into everyday life! Thanks for your feedback ladies. I’m pleased the pipe cleaners where useful for bedtime too!